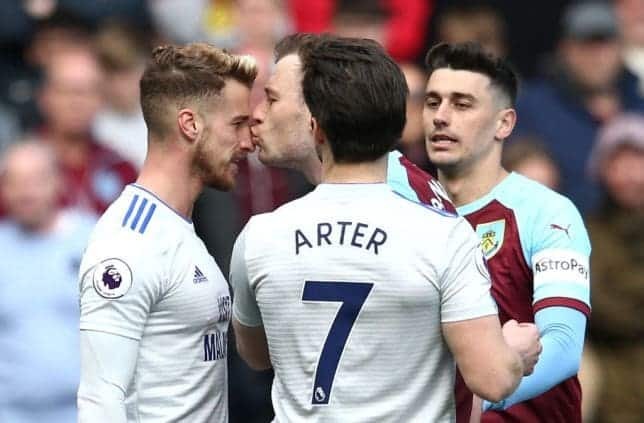 A Premier League match pitting Burnley and Cardiff City played on Saturday, April 13, was characterized by dramatic scenes even as the Clarets marched to a 2-0 victory. The high stakes relegation battle presented a rather bizarre incident after Burnley's Ashley Barnes kissed his opponent on the nose to earn a booking from Mike Dean who officiated the match. The incident happened moments before the break when Cardiff City's Joe Bennett fouled Barnes to spark an ugly confrontation. In a video that has since gone viral, the two players can be seen embroiled in a face-off before Barnes decided to kiss Bennett on the bridge of the nose twice. Both players were booked for their actions, and luckily for Barnes, Harry Arter was there to pull him away from the flash point. Meanwhile, Chris Wood's brace during the tie was the difference as Burnley carted away all the three points at Turf Moor. Cardiff remain 18th on the log with 28 points, with relegation to Championship looking inevitable. Earlier, Legit.ng had reported how Liverpool striker after scoring three goals in four appearances for the Reds. The Senegal international scored twice in the 4-2 win over Burnley as well as opening the scoring in Liverpool's 2-1 success at Fulham. Sadio Mane however pipped teammate Andy Robertson as well as Seamus Coleman, Bernardo Silva, Jamie Vardy and James Ward-Prowse to win the prize.